Berry Head, what a beautiful place. The wildlife love it too!! So many types of sea bird - the Guillemot, Razorbills, black legged Kittwakes and dozens of others frequent this stunning headland. Lots of unique plants too. The head is part of the English Riveria Global Geo Park a wonderful geological area of landscape and seascape. It is pretty old, around 400 millions years!!! It is also not surprisingly a Country Park and part of the South Devon Area of Outstanding Natural Beauty. 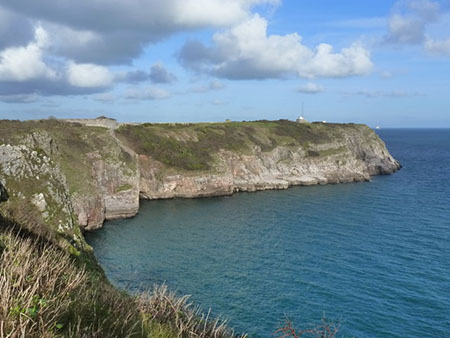 The South West Coast Path has one of its "Summer Strolls", a circular walk round Berry Head. Starts at the Visitor Centre. Quite an easy walk and OK for wheelchairs and pushchairs. One can even hire a mobility scooter at the Visitor Centre! Brilliant views! The Head is run by the Torbay Coast & Countryside Trust. Apart from the Head, Occombe Farm and Paignton they are responsible for Cockington Country Park, Occombe Farm, and the Seashore Centre on Goodrington Beach. Most of the English Riviera Global Geo Park is in their care as well. 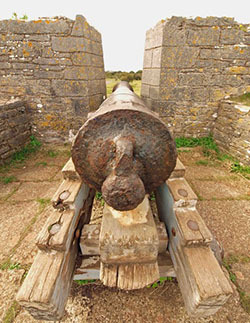 The Centre is part of the refurbished Napoleonic Fort and was once the Guard House. Apart from telling visitors about the fort as one would expect, it is the start of the South West Coastal Path coastal Walk and of course is a mine of information about Berry Head. 100 acres of nature reserve in fact, there are some quite rare plants and animals, unique in the country in some cases. As such it is part of another important organisation the European-wide Natura 2000 network. This network takes great care of such places as Berry Head. They have Special Areas of Conservation which takes great care of such rare plants and animals, but not birds. Birds are taken care of by Special Protection Areas. Great work from both those organisations. Check out the Visitor Centre - CCTV pictures are good for watching birds too! The camera is on the cliffs in a great spot. Guillemots are those dark brown, black with white front. Berry Head has the largest breeding colony on the south coast. This limestone cliff 65m above the sea is the home of Greater Horseshoe bats. If you do not like bats - don't worry they live in the caves! Another endangered species though. There are lots of other birds as well, small ones you may also see in your garden to all sorts of sea birds. Lots of Herring Gulls, Razorbills that only come to land to breed, Kittiwakes, Shags and Fulmars. Walk round and you might see Linnets and Stonechats. Some rarer birds too. Some plants like thin soils and do well on Berry Head. Many plants here do not grow anywhere else and are protected as part of this Nature Reserve. Lichens of course. They love bare exposed places. The White Rock Rose flowers from March to July and grows to 50cm tall. 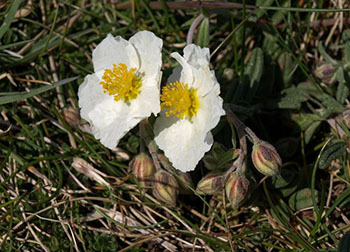 The flowers can grow to 30mm scross, white with yellow centres and stamens with three to 10 per stem. Quite rare. The oddly named and very rare elsewhere Small Hare's Ear grows here too, but is very tiny and hard to see. The flowers are yellow and no bigger than a pin head! The Small Rest Harrow, a herb, is another plant that needs special protection. The Spring Gentian is a tiny blue flower. Beacons, large bonfires, were lit on high points all along the south coast and up to London to warn of the Spanish Armada. In our eyes it was a bit primitive, but those fires can be lit quickly. Watchers would see the one to their right and light theirs. The next one would do the same. It was certainly effective. It was not the earliest method! There was an Iron Age fort on the site. That fort was only destroyed when another was built as a lookout in the Napoleonic Wars during the early 1800's. Even the Romans thought this was a great lookout. That Napoleonic fort has recently been restored and is open to the public. Gives a fantastic view over the sea. Would have been another very effective lookout!! There are more modern activities on the site from the Second World War to the Cold War. All worth a wander round and views as a bonus! 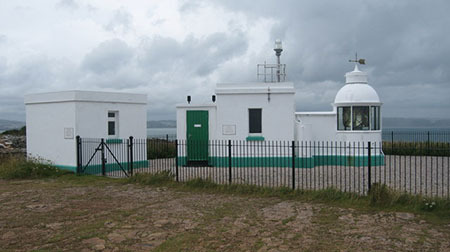 The lighthouse is another stand out facility for the Head as a lookout point. It is a Trinity House lighthouse. Trinity House are the General Lighthouse Authority and provide all those lighthouses in England, Wales, the Channel Islands and even Gibraltar. An essential aid to the safety of shipping. Since the reign of Henry VIII in the early 1500's many a ship has been saved by the sight of these lighthouses. Berry Head Lighthouse was built in 1906, was converted in 1921 to an unwatched lighthouse. In 1994 it was modernised and now runs on mains electricity. Berry Head Lighthouse is both the shortest and the highest lighthouse in the British Isles!! The statement seems to contradict itself! As a building at 5 metres it is the shortest, but on that promontary it is 58 metres above sea level. It was originally said to also be the deepest because of the fact that a weight that used to turn the light went down a shaft about 45 metres, almost the depth of the promotory. You may prefer to browse some more, please do, you will find navigation buttons above on the left.